However it is not the topic for day. Rather I want to share a differentexperience. One I shared with my beautiful daughter. and when she suggested we went the day after 5 day’s horse riding, why wouldn’t I? and drove to the appointed place without getting lost. This could not be described as an unprepossessing building. And yet here I was again. And A Gift it was. This time it was just OUR gift. and no other women, naked or clothed. not a spot of linoleum anywhere in sight. to enjoy a drink to Savour the memory rather than Expunge it. And so it is that the same words are used to describe two very different experiences. and go back to work. Author leepowriePosted on October 26, 2018 January 23, 2019 Categories Concerts, Melbourne, UncategorizedLeave a comment on Melbourne Sparkles in Spring…. from the orchestra through the entire centre. But who is She, that I am raving about? Ten years younger than me. I remember the talk about this amazing musician, throughout the years while I was still trying to learn the basic Fur Elize on the piano, she was wowing the world with her artistry and at 13 was invited by Herbert Van Karajan to play with the Berlin Philharmonic !!!!!! She owns 2 Stradivari’s – I do not know which one she used when I saw her. And that, dear friends, was just another Friday morning in my Melbourne. This is the second concert I have been to of a totally unfamiliar genre/work. Not something I usually do – I always play safe when I book my concerts. And the music, Elgar at his most sublime. On this occasion Jackie and I went to browse the Triennial exhibition. until the lure of a late lunch (very late) was too strong to resist. Everywhere people engaged, absorbed, participating. I had decided a long time ago that I would never pay to hear/see any of Wagner’s works. I apologise to the aficionados who ‘get him’; I mean no offence. But 15 hours for one work; too long; too loud; too many high notes; too much for me. So it was with some chagrin and surprise that I found myself at a concert on a Friday morning (yes I have joined the ranks of the ‘seniors’), having bought a ticket to hear my beloved Beethoven, only to discover that before him, I would be listening to Wagner. Seated alongside the orchestra instead of in front. By the sound of Wagner. and all too soon it ended. Admittedly there were no voices, only the large orchestra and I was so close I could read the music of the harpists below me – so it was visually fascinating too. Just maybe, I will give Wagner another ‘go’ one day. In the meantime I shall continue to delight in the familiar accessible glorious majestic tones of Beethoven’s Emperor Concerto which was the finale. I mean, take saddles for example. Yes, that’s what I said, saddles. They go onto the backs of horses. Ever thought about them? Well of course not, nor had I until last week. Like chicken breasts from the supermarket, saddles, just ‘were’. How many of us think about the size of the chickens that offer us these juicy large breasts – when I did, I baulked at the thought that they may be the size of dogs!!!!! So why would we think about a saddle? No reason of course since we don’t eat them, and most people don’t go near them in day to day life. Except I am not not on of the ‘most people’ having decided well into my 60’s that I shall learn to ride. Which means sitting in most instances on (in?) a saddle. Still I gave it (the saddle, not the horse) little thought – it just Was. Some saddles rubbed me in uncomfortable places, some buckles chaffed and left reminders long after the ride was over, but mostly they just came with the territory. Until I changed my territory and went on a fabulous trail to the High Country (blog to follow: HiddenTrails,Globetrotting.com.au) where I met a Saddle Maker. Not just ‘a saddle maker’ but Peter Horobin and his daughter Marlee who make saddles which are sent all over the world; these are ‘bespoke’ saddles – think Kate Middleton Duchess of Cambridge and her bespoke dresses and you get the idea. Peter was amazing, teaching us about the muscles and bones around the shoulder of the horse, how saddles impinge or don’t on their movement, how poor mounting (climbing into the saddle for my non riding friends the wrong way) can bend the tree. Yup, its okay I also didn’t know what he was talking about and heard the voice of a rather dumb naive blonde (that would be me) ask what on earth he meant. Turns out a tree isn’t what we were seeing all around us, but rather part of the saddle, a foundational part in fact. And of course there was a next step – a visit to his shop/workshop/sanctuary/creative studio which I did today after my third only riding lesson put on the Mornington Peninsula. And what a wonderland of energy, passion, skill and hospitality. The saddles – there are SO many different types, every one hand made, so many colours, so many uses, so many textures, it was like entering Aladdin’s cave, an abundance of smell, touch, leather, style and confidence. I wished I had a horse so I could indulge myself with a saddle. Instead I got to polish the saddle being shipped to Western Australia to Carla – a special new friend, with whom we rode in the High Country. Templates for every saddle – and don’t muddle them up!!!!! And I had NO idea that a saddle could be such a special, wonderful creation – I thought only quilts fell into that category – another lesson learnt. And for the moment, I too am caught up in the excitement that is Melbourne in Grand Final Week. Even to wearing a scarf. You bet it is yellow and black. And I mean Wearing it, all day, every day, to Park Run (I was not alone) to the shops, (I was not alone), to the grand parade, walking Coco; watching TV. And everywhere complete strangers become friends as the yellow and black unites us. Founded in 1885 Richmond is a very ‘old’ club with its own railway station (well almost) The club has not won a premiership since 1980 – which in football terms is a very long time. Every time I read up on Richmond there is a different reason put forward for the remarkable passion the Richmond followers have for their team; from the age of the club to the club song (which is very catchy); to the colours to this to that 😂 so it would appear, no one is quite sure why. But there it is, Richmond fans are loyal and fanatical. Whatever the reason, when the state declares a public holiday and Richmond is now in the finals, one just HAs to go to the grand parade in the city. Apparently 150 000 other supporters also HAD to go. We travelled in by train – together with families of all shapes and sizes, single tragic supporters, couples, – the train was packed; standing room only. And so the fun began. Melbourne put on its best face, the sun shone, but not too strongly, the wind blew, but not too briskly, the crowd moved, but not too quickly and we just smiled and allowed the throng to take us with it. A stop for a coffee gave us time to watch the world go by and then on to the parade. We could see nothing of The March – we just weren’t tall enough with the crowd so deep. It didn’t matter. The people, families, couples, singles, everyone willing their team to win, everyone soaking up the weather, the city, the energy, the glorious atmosphere that is Melbourne. Our stomachs were calling us to fuel them, and we looked for a table – there were hundreds, all taken. Resourceful Jackie found us a corner and amongst scores of yellow and black clad diners, we shared a lovey paella, talked about everything football and non football; and wandered home, weary but so grateful to be in Melbourne at Grand Final time. All that remains is to survive the actual match, families meeting in so many different places and ways. Some 120 000 lucky enough to be at the MCG, some at home, in hotels, in pubs, the city is Pumping with energy as we wait for our team to….. well that’s the question – win or lose? Time will tell. While on a visit to London earlier in the year I found The Globe theatre closed. Surprise surprise – it turned up in Melbourne. 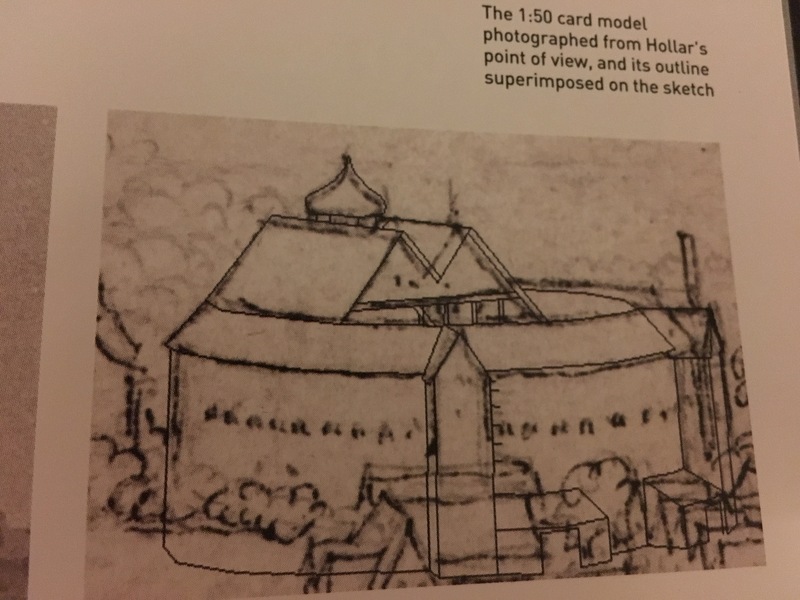 Using meticulous research including sketches like this (Czech artist Hollar -1630) one of London, together with archeological reports on the dig of the first Globe these innovative (and brave) New Zealanders created this replica. 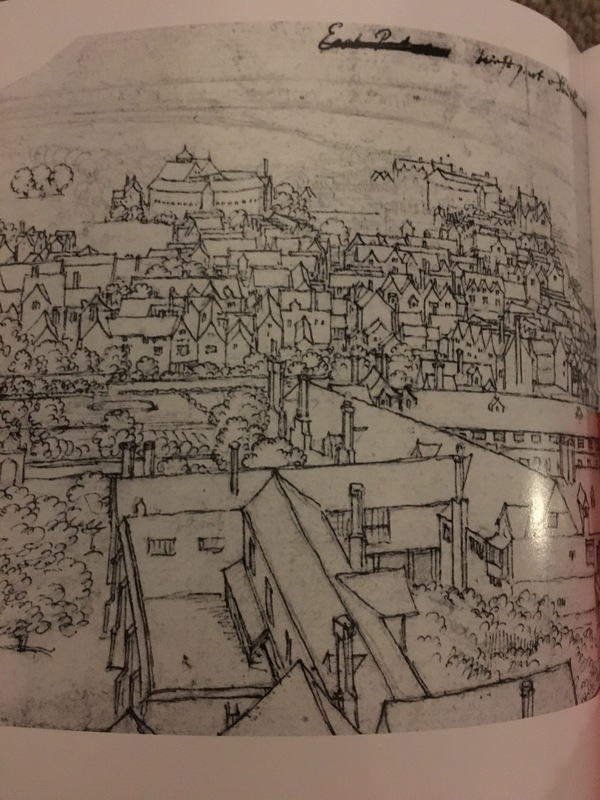 Their dream was to see Shakespeare’s work performed in its original space, to build the worlds first full scale temporary working replica of his theatre; fill it with a festival of his masterworks and share it with as many people as possible. And so it was that Claire and I went to see what the fuss was all about. Aside from the fact that a walk through Melbourne’s stunning gardens to reach the theatre is a treat in itself, the Pop Up Globe is enchanting; the actors quite amazing, the energy exhausting and the desire to see another production strong. ps. No fruit was thrown, but rain fell – all adding to the atmosphere – almost like being in England!!!! I had heard about park runs for quite a while. Friends of mine all loved it and ‘did’ it and talked about it. But these friends were sociable beings, always doing things in groups, super fit, good runners, supremely confident. Me? Don’t be crazy, I’m old, unslim (such a word? – there is now)and not all that good in ‘group activities’ so I stayed away. Until I didn’t… reluctantly and nervously I succumbed and joined J at Jells Park at 8am. I had no idea what to expect, what to bring, what to do, take my car keys, bring water, leave my jacket where? This is a volunteer run community group showing people working together at its best. The welcome so genuine, the smiles so easy, leave your jacket here, its perfectly safe. A short chat to congratulate milestones (50 runs etc), brief chat for the newcomers and then we were all off. A bell is rung and the front runners who had already run who knows how far before joining our run. This was a very serious time trial for them as they took off like the proverbial bats. They are remarkable as without fail I notice each week, they arrive at the finish line as I begin my second lap. There are mums with new borns in prams; family groups; a grandpa and his young granddaughter – who hold hands the entire route. I am not sure who is supporting whom, but this will be one of those remarkable memories for her that will bind them forever. There are young children and old ladies – me amongst them, and old men. Everyone out and doing the best they can, and no one cares whether it is fast, slow, sprinting, jogging or walking. It is the spirit of being out. And Jells never disappoints – whatever the weather, it is a special place. After the first run – followed by yummy coffee with new friends, I was hooked. And so is my special four legged friend who has run it with me every week since then. Author leepowriePosted on September 23, 2017 May 31, 2018 Categories Coco - my four legged friend, Melbourne, ParksTags dog, living, park run, peopleLeave a comment on Park Run?